Outside my window overlooking Istanbul’s main pedestrian Istiklal St. rowdy recent demonstrations have given vocal testimony to the fragmentation of Turkey’s self-image between the West and the Middle East: secularists condemning America, Islamists condemning Russia, others decrying Syria, Israel, Kurdish insurgents, the ruling government in Ankara (and lots more besides, see right). At the same time, Istanbul is also acting as an incredible magnet for a new generation of young adventurers from Europe, America and beyond. Pope certainly is an authority on the subject of Turkish politics. He’s lived in Istanbul for 25 years and speaks fluent Turkish, in addition to the Arabic and Persian he picked up while at Oxford University. He first came to Istanbul to work as a journalist in 1987, but had visited Turkey a few times before, first as a student in 1980 and on breaks from Middle Eastern conflicts. “After so long, do you become Turkish?,” I half-jokingly ask. “No, you become a sort of semi-Levantine!,” he replies. A British national but born in South Africa, Pope never really felt at home in England after moving there aged nine. “When I left university in 1982 there was a deep recession, and it was difficult finding a job,” he explains. Yet I suspect he’s making excuses; he probably would have been eager to leave even if the economy had been stronger. “I was offered a job working as a journalist at the Tehran Times, but I couldn’t get a visa”. Rather than return to London, Pope booked a one-way ticket to Syria, aged 22. He covered the region working as a freelance journalist until, in 1987, Reuters offered him a position based in Istanbul. “They put me in this amazing flat in Arnavutköy, overlooking the Bosphorus.” But it wasn’t all positive. The traffic at the time was terrible – worse than it is today, he tells me – and the brown coal pollution in winter was so bad that sometimes you couldn’t see more than a few metres in front of you. “It was like the London smog of the 19th century,” Pope explains. Leaving Reuters in 1990, Pope returned to freelance work. “During that time I worked for a range of media; the Independent [a British newspaper], the BBC, the LA Times, and the Wall Street Journal.” But it was with the Independent that Pope felt he could write stories as he wanted, and he leapt at the chance when the paper retained him as a nearly full-time Istanbul correspondent in 1992. In the late ‘80s and early ‘90s there was a lot of coverage on human rights and other ‘bad news’ stories, so Pope would look for more positive stories to try to break up any negative stereotypes. And life as a foreign correspondent was certainly busy, especially since, before live TV news, seeing things mattered. “Once I went to Ankara twice in one day,” he tells me. “That was when Turkish Airlines gave journalists flights for $30. I went out to do a story in the capital, then there was a bomb in Istanbul, which I raced back to cover, before heading back out to Ankara”. 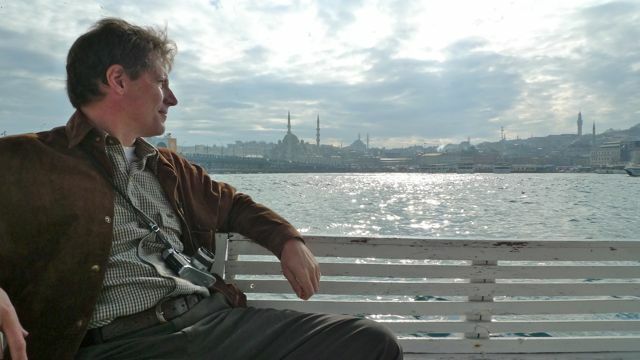 I ask him whether he ever thought of leaving Istanbul. He not only thought about it, but did leave; it was 1995, and he left Turkey to return to South Africa as the Independent’s correspondent. But the move didn’t bring what he was looking for, and so he returned to Istanbul three months later. But it was a positive experience, and Istanbul was his base for covering, at one point, 30 countries in the region; at least, up until the Iraq War in 2003. Pope says he lost heart covering the story, and that the Journal’s editorial pages went ‘war mad’. “I became disillusioned,” he explains. By 2005, he had become fed up with traveling to the Middle East to write stories in which the American audience expected a viewpoint that Pope found it increasingly difficult to deliver. Pope took an unpaid year off, and got out of Istanbul. With his wife Jessica Lutz, a Dutch novelist, he built a house in the mountains above Olympos, in south-western Turkey, expecting to have the option of returning to work at the end of the year. However the Journal had other ideas. Following a downsize, the job was no longer there and he was demobbed with a half year’s pay. But as the saying goes, it’s darkest before dawn. The negative stereotypes of the Middle East that had formed since 9/11 gave Pope the inspiration for his next book, Dining with Al Qaeda [published 2010]. This memoir brought to life his Middle Eastern adventures; in one instance, Pope had to ‘argue’ for his life with a Saudi cleric who had tutored several of the 15 suicide bombers of 9/11. That Pope is still alive today is surely testament to his Arabic skills. But the fact that he then made friends with the cleric and took him out for a Chinese meal in Riyadh makes me think there’s more to Pope than meets the eye. Nowadays Pope seems content with life here in Istanbul. But the pace hasn’t slowed. Since 2007 he’s been the Turkey / Cyprus project director for the International Crisis Group, which seeks to prevent worldwide conflicts. Does have he have any thoughts of England? Pope, “the semi-Levantine”, threatens to visit his brother in the South-West of England, where he went to school. “I love the countryside there and I keep promising I’ll visit soon. I have to take up a voucher for a free lesson at Sherborne’s croquet club”. But I can see he’s in no hurry.